We have prepared an infographic of Top 20 R packages for data science, which covers the libraries main features and GitHub activities, as all of the libraries are open-source. In our previous articles, we have already discussed top libraries for Data Science in Python and Scala. But this list of articles will not be complete without R. All of these programming languages are popular for different data science tasks and projects and have their supporters and opponents. So while we are arranging a comparison of how these programming languages relate to each other, we have prepared some of the most useful R libraries for data scientists and engineers, based on our experience. R is a well-known and increasingly popular tool in the Data Science field. It is a programming language and a software environment primarily designed for statistical computing, so its interface and structure are very well suited for the scientific tasks. Moreover, R has one of the most developed libraries systems that counts thousands of packages to solve a wide variety of problems. Although there are many general-purpose packages, we want to focus on those that provide sufficient capabilities for data manipulation, visualization, competitive research, and machine learning. 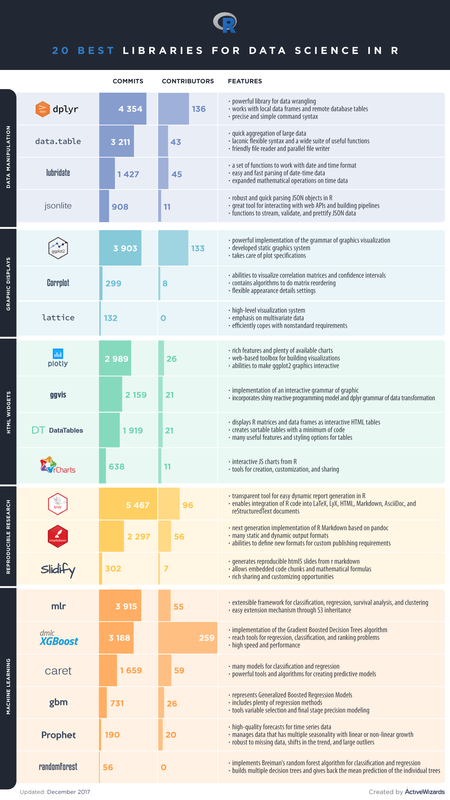 Therefore, we have prepared an infographic of Top 20 R packages for data science, which covers the libraries main features and GitHub activities, as all of the libraries are open-source. Of course, this list of libraries is far from complete, but here we have collected the most generic and time-tested tools in our opinion. There are many other specific libraries that might be more efficient while solving particular tasks, so do not hesitate and share your thoughts and experience in the comment section.